Doramectin is a broad-spectrum antiparasitic active ingredient used in veterinary medicine in livestock against external parasites (lice, mites, etc.) as well as against internal parasites (e.g. roundworms). It is not used against agricultural and household pests. It belongs to the chemical class of the macrocyclic lactones. The table below indicates some usual dosing recommendations for doramectin issued by manufacturers or documented in the scientific literature. They may not be approved in some countries. Doramectin is a macrocyclic lactone with a broad spectrum of activity similar to ivermectin. It is effective against roundworms (gastrointestinal, respiratory, renal, in the skin, etc.) and, depending on the delivery form and the dosage also against a number of external parasites such as lice, mites and various myiasis. However, it is ineffective against tapeworms and flukes, and at the usual use recommendations it doesn't control fleas, stable flies, mosquitoes, horse flies, multi-host ticks (e.g. Amblyomma spp, Dermacentor spp, Haemaphysalis spp, Ixodes spp, Rhipicephalus spp, etc.) and several other external parasites. In the last years it has been increasingly used in some countries against cattle ticks (Boophilus = Rhipicephalus microplus) and horn & buffalo flies (Haematobia irritans). Against cattle ticks, both as an injectable (at 0.2 mg/kg) and as a pour-on (0.5 mg/kg) control is usually better than with ivermectin (~95%) but without knock-down effect, i.e. the treated animals need 7-10 days to become more or less tick free. Control of horn & buffalo flies is initially sufficient (~85%) but falls down quickly after the first two weeks. Doramectin is moderately used in livestock, mainly in pour-ons and injectables. It is not used at all in pets or horses. In most finished products, efficacy and safety depend not only on the amount of active ingredient(s) but also on their formulations (i.e. the type and amount of so-called inert ingredients), particularly in injectables and in topical pour-ons and spot-ons. These inert ingredients can significantly affect the pharmacokinetic behavior (e.g. absorption through the skin or from the injection site, distribution within the body, spreading throughout the body surface, etc). Generic products usually contain the same amount of active ingredient(s) as the original product, but often in quite different formulations. In many cases, the curative (therapeutic) efficacy of the different formulations is quite comparable, but the protective (prophylactic) efficacy that determines the length of protection against re-infestations may be rather different. Topical (pour-on) Cattle ticks 0.5 mg/kg. Control is usually good (~95%) but without knock-down effect. Subcutaneous Cochliomyia hominivorax 0.2 mg/kg; healing after 4-6 days ; ~35 days protection. Subcutaneous Dermatobia hominis 0.2 mg/kg; healing after 6 days ; ~35 days protection. Subcutaneous Cattle ticks 0.2 mg/kg. Control is usually good (~95%) but without knock-down effect. Subcutaneous Psoroptes ovis 0.2 mg/kg; animals free of mites 7 days p.t. Intramuscular Sarcoptes scabiei 0.3 mg/kg; animals free of mites 14 days p.t. Learn more about doramectin safety. In livestock: Yes, cross resistance with ivermectin, very frequent in gastrointestinal roundworms of sheep, goats and cattle. There are a few reports on cattle ticks (Boophilus microplus) resistance to ivermectin likely to show cross-resistance to doramectin. 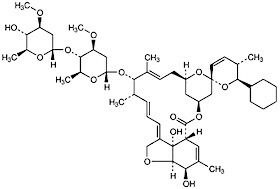 Doramectin is a semi-synthetic macrocyclic lactone obtained from fermentation products of the soil microorganism Streptomyces avermitilis. It has quite similar features to those of ivermectin. The spectrum of efficacy is almost identical. Doramectin is ZOETIS' (formerly PFIZER ANIMAL HEALTH) macrocyclic lactone for livestock. It is not used in dogs and cats because PFIZER developed its own endectocide for dogs and cats called selamectin. Doramectin is effective against the major parasitic roundworms: gastrointestinal (e.g. Haemonchus spp, Cooperia spp, Ostertagia spp, Trichostrongylus spp) and pulmonary (e.g. Dictyocaulus spp). It is also effecive against most mites and lice species, and against numerous myiases (e.g. those caused by screwworm flies, bot flies and warble flies) usually regardless of the delivery form (pour-on, injectable, etc). However, at the usual therapeutic dose, doramectin products are ineffective against tapeworms and flukes, mosquitoes, fleas, horse and deer flies, stable flies and several other flying insects. Cattle horn flies are only controlled by pour-on formulations. Cattle ticks (Boophilus spp) are only sufficiently controlled by pour-ons. Other ticks (e.g. Amblyomma spp, Hyalomma spp Dermacentor spp, Ixodes spp, Rhipicephalus spp) are not controlled at all by doramectin products. Some studies indicate the doramectin (as a pour-on) is slightly more efficacious against cattle ticks (Boophilus microplus) than ivermectin. Injectable doramectin at the usual dose (200 mcg/kg bw) seems to be also more efficient against sheep scab mites (Psoroptes ovis) than ivermectin. Doramectin has a slightly longer residual effect than ivermectin, but this strongly depends on the formulation, the delivery form and the administered dose. Nevertheless, the difference between doramectin and other macrocyclic lactone for livestock is rather small. This probably explains why there are thousands of generic ivermectin products, and only a few doramectin generics. Generic ivermectin was available earlier than generic doramectin, and for most uses on livestock ivermectin is good enough. Halftime for absorption into blood after injection in a sesame oil vehicle is shorter for goats (~0.7 days) than for cattle (~2.4 days) or sheep (~2.7 days). Doramectin is well distributed throughout the whole body including target organs such as the gastric and gut mucosae. The highest concentrations are found in body fat that acts as a depot from where it is progressively released to blood. Bioavailability of doramectin after injection is almost 100%, but only about 18% after pour-on administration, which requires a higher dose. Excretion goes through bile and feces, 50 to 70% in the form of the unchanged parent molecule. The highest concentration in blood occurs 24 to 48 hours after administration. As all macrocyclic lactone doramectin acts as agonist of the GABA (gamma-aminobutyric acid) neurotransmitter in nerve cells and also binds to glutamate-gated chloride channels in nerve and muscle cells of invertebrates. In both cases it blocks the transmission of neuronal signals of the parasites, which are either paralyzed and expelled out of the body, or they starve. It also affects the reproduction of some parasites by diminishing oviposition or inducing an abnormal oogenesis. In mammals the GABA receptors occur only in the central nervous system (CNS), i.e. in the brain and the spinal chord. But mammals have a so-called blood-brain barrier that prevents microscopic objects and large molecules to get into the brain. Consequently macrocyclic lactones are much less toxic to mammals than to the parasites that do not have such a barrier, which allows quite high safety margins for use on livestock and pets. A notable exception to this are some dog breeds that carry the MDR-1 mutation.